Health & BeautyOlimp Forsen - 30 kaps. 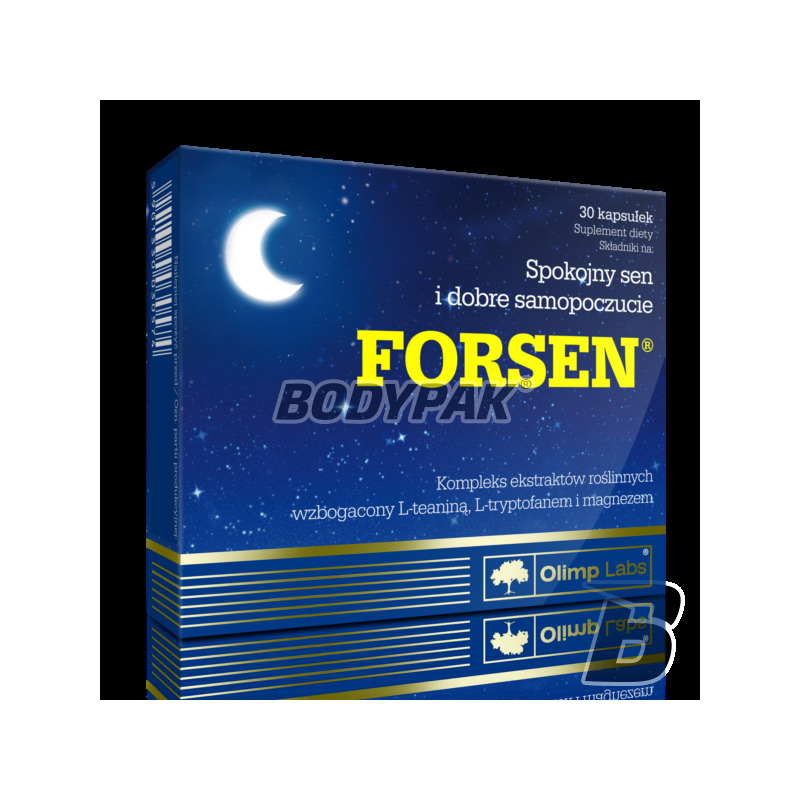 Forsen complex is a complex of natural ingredients - plant extracts (oats, lemon balm, hops and saffron), L-theanine, L-tryptophan, GABA, magnesium and selected B vitamins prevalence of insomnia is significant, Poland - according to surveys - it affects approx. 10 percent of the population. Periodic sleep problems are found in 40-50% of the adult population. Stress, a busy lifestyle, personal or professional problems - are the main causes of sleep disorders. These may include difficulty falling asleep, maintaining sleep or waking too early. These disorders can lead to a much worse mood and impaired functioning in everyday life. What does Forsen® and how does it affect sleep? Sleep and wakefulness is controlled by the dynamic interaction between multiple regions of the central nervous system (CNS) as well neuromodulatorami and neurotransmitters involved in the regulation of the interaction. - Lemon balm (Melissa officinalis) - affects the metabolism of neurotransmitters, showing a soothing nervous tension which is one of the main causes of problems with falling asleep. - Hop cones - have a calming, making it easier to fall asleep and improve sleep quality and continuity. - Saffron (Crocus sativus) - the main active ingredients of saffron - safranal and crocin - increase the level of neurotransmitters in the brain, m. In. serotonin, which plays an important role in regulating the sleep-wake cycle, allowing for a healthy and restful sleep. Normal levels of the substance, described "happiness hormone", it affects mood and shows a natural anti-depressant. - L-theanine - an amino acid that affects the brain. Increases generation by brain alpha waves, which testify to the mute function of the brain and prepare the body for sleep phase. - L-tryptophan - a metabolic precursor of serotonin, it is produced "the hormone of happiness." - Gamma-aminobutyric acid (GABA) - is an amino acid inhibitory neurotransmitter, and - generate the formation of inhibitory postsynaptic potential, which leads to block the excitability of nerve cells, and thus contributes to the promotion of the natural physiological sleep. - Niacin - in the case of insufficient supply of food is synthesized from L-tryptophan. Then there is a reduction in the pool of tryptophan, which is produced serotonin affecting the adjustment of the sleep cycle. - Vitamin B6 - involved in the synthesis of many enzymes, hormones, and hemoglobin. It is essential for the metabolism of magnesium and promotes its absorption. Also shows synergism with the pharmacological tryptophan, participating in the production of serotonin.